What makes a man decide to go on a sea voyage, climb a mountain, or do anything else that doesn’t contribute to the daily needs of survival? Some would say, like Mallory, “Because it’s there.” Others might argue that expeditions like these feed the ego. I say they’re a relief valve for the constraints of every day life in Western society. Native Americans had vision quests, Australian aborigines did walkabouts, and most native peoples went on seasonal foraging peregrinations. Why shouldn’t I? Besides, adventures are fun. When launch day for my Seattle to Port Townsend rowing trip dawned, the temperature seemed to drop, the winds picked up, and small waves started to build across the shipping channel. I silently wondered if this adventure would be fun, after all. I remembered a fall day on nearby Vashon Island where the wind blew 15 to 20 knots for more than 24 hours, turning the waters into a frothy mess. I hoped that wouldn’t happen now. I told myself that the Terrapin could handle the conditions. There was nothing to worry about. 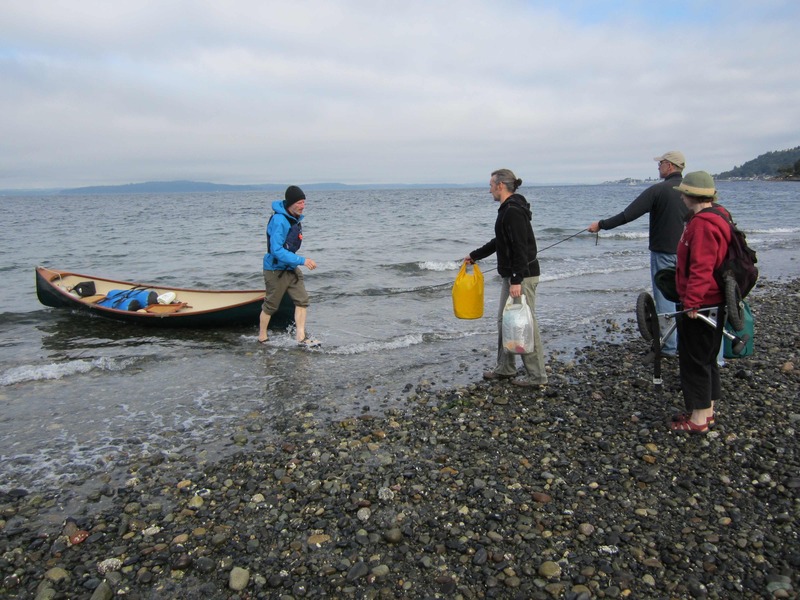 “Are you sure you this is the right day to go?” my wife asked dubiously, as she and a crew of five friends unloaded the dry bags with a week’s worth of food and gear at West Seattle’s Lowman Beach. I looked out at the water, put on my best Old Man and the Sea face and stoically replied that I’d be fine. The sea was calling me and I wouldn’t turn back. Terrapin’s hull ground against the rocks as I loaded her. The sound sent a shiver down my back. My desire to rid myself of that awful noise led me to load the boat more hastily than I would have preferred. I set my gear in its accustomed place, but didn’t lash anything down, figuring I’d do it off shore. My friend Lisa must have sensed my eagerness to be off; she waded into the chilly waters in her nice leather shoes to help me finish loading up. Then, before I could give it a second thought, I kissed my wife goodbye and rowed off into the wind, watching the crew on the shore get smaller and smaller, until at last they turned away, leaving me truly alone.